Just when you thought you were starting to get a handle on the two dozen or so views available in Project 2013. Every one of those views can be customized to show a different type of information. You can customize every view in Project 2013 to show specific types of information. For example, you can choose to show columns of information in spreadsheets, labels in Network Diagram boxes or task bars, and sets of data in graph views. You can also modify the size of panes of information and adjust the timescale. Why all this flexibility with the information you see on-screen? At various times in a project, you need to focus on different aspects of your tasks. If you’re having a problem with costs, take a look at Resource Usage view and insert various columns of cost information, such as resource rates and total actual costs. If your plan is taking longer than the Hundred Years’ War, consider displaying Tracking Gantt view and looking at a bunch of baseline columns with timing and dependency data or examining the project’s critical path in the chart pane. If you need to display more of the sheet area so that you can read those columns without having to scroll, you can do that, too. In the following sections, you find out how to do all the things you need to do to show a variety of information in each view. Several views have two panes, such as Task Usage, Tracking Gantt, and Resource Usage. When the Timeline appears with a view, it appears in a third, horizontal pane at the top. You can modify the information you see in the sheet pane as well as the scale for timing in the chart pane. You can also display information near task bars in the chart pane. In views that show more than one pane, you can reduce or enlarge each pane. This capability helps you see more information in one area, depending on your focus at the time. The overall area occupied by the panes is constant, so when you enlarge one pane, you reduce the other. Place the mouse pointer over the edge of a pane. Drag to the left: Enlarge the pane on the right. Drag to the right: Enlarge the pane on the left. Drag up or down: Change the size of the Timeline pane versus the area that’s available for the rest of the view. 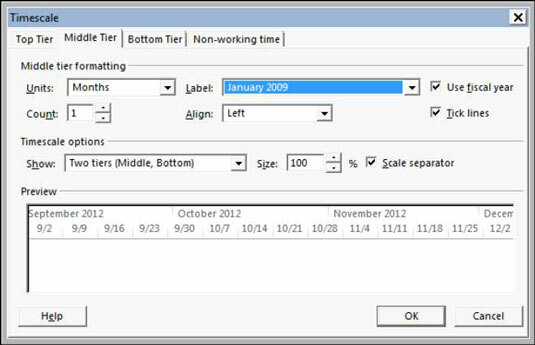 Project 2013 allows you to do is modify the timescale to display your plan in larger or smaller time increments. A timescale consists of a possible total of three tiers that you can use to display different time increments. For example, the top tier can mark months; the middle tier, weeks; and the bottom tier, days. This variety of detail lets you easily observe the overall task length and points in time during the life of the task. You can use all three tiers, only the middle tier, or the middle and bottom tiers. This feature is especially helpful because projects can span several weeks to several years, such as construction or pharmaceutical projects. This scaling feature is the only way to view such large-scale efforts. You can modify the units of time and the alignment of each tier and also add tick lines to mark the beginning of each increment on the timescale. You also decide whether to include nonworking time on the timescale. You can also display text labels near task bars and specify which data is included. Labels can be placed above, below, inside, or to the left or right of the task bars. Especially in projects where you display many columns of data and a lengthy schedule, a task bar can be placed far to the right of the sheet pane data. Select the Timescale format at the bottom of the Timescale drop-down menu. The Timescale dialog box opens. Click a tier tab and select a style for Units, Label, and Align. For example, if your Units choice is weeks and you change the Count option to 2, the timescale appears in two-week increments. To prevent the display of a certain tier, select One Tier or Two Tiers from the Show drop-down list in the Timescale Options section. If you want Project to use fiscal-year notation in the timescale, select the Use Fiscal Year check box. For example, if your 2013 fiscal year begins July 1, 2013, 2014 applies to all months in the fiscal year. Set the fiscal year by choosing File→Options→Schedule. To show marks at the beginning of each unit of time, select the Tick Lines check box. Repeat Steps 2 through 6 for each tier that you want to modify. Click the Non-Working Time tab. In the Draw options, select the one you prefer. Your choices are to have the shaded area for nonworking time appear behind task bars or in front of task bars or to simply not appear. In the Color or Pattern list, select different options for the shading format. Click the Calendar setting and select a different calendar on which to base the timescale. Click the OK button to save your new settings, which apply only to the timescale for the currently displayed view. Use the Size setting on the three tier tabs to shrink the display proportionately and to squeeze more information on your screen or the printed page.